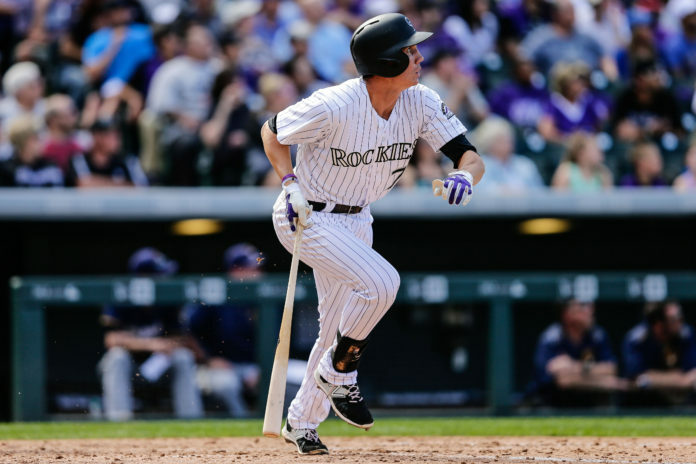 On Thursday, in our Blake Street’s Youth Movement series, we detailed how Trevor Story improved from both of his very different halves to his rookie season. Today, we’ll be looking at Jordan Patterson who got called up late into the season and still made the best of his stay with the Rockies, even if his playing time was limited. Jordan Patterson, in limited time, showed the Rockies organization that he’s willing to help any way he can. 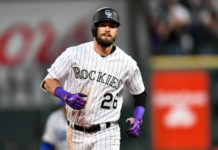 Flexibility in different roles, such as playing anywhere from outfield to first base, is how Patterson will make his mark in Colorado, and it’s what will help him stand out in what is sure to be a crowded outfield going into next season. In the last game of the season, he made his third start of the year and recorded his first Major League double and RBI to tie up the game and send it into extras. He had a similar opportunity in the game before to potentially tie the game. 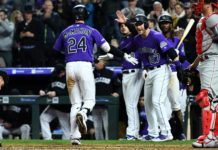 Patterson says he is constantly learning from DJ LeMahieu, Charlie Blackmon and Nolan Arenado so he can always evolve as a player. Not so long ago the aforementioned guys were rookies. Now they are in the primes of their careers and are ready to mentor this young core. You better believe Patterson is taking notes. This is a part of a week-long series. Make sure to check back tomorrow, to hear how the late great Jose Fernandez inspired Carlos Estevez when times got tough in his rookie campaign. If you missed yesterday’s story about Trevor Story, click here.